On the assumption that the rubber compliance bushes in the lower arm and the ARB mounting under the chassis absorb a certain amount of the impact or shock load I'm wondering if the potential problem is aggravated if the harder poly bushes are fitted. I have a standard set up albeit with a 28mm diameter ARB. I scraped the paint away around the weld between the ARB mounting block and the chassis and was a bit concerned to see the amount of rust on the chassis directly next to the weld even though the paint looked good. This may be caused by the fact that the weld fillet is probably a different steel alloy to the chassis material and so you effectively have dissimilar metals in direct contact. The residual stress in the weld could also contribute to the corrosion. Having said all this, once I wire brushed the rust away there was no sign of any cracking or splitting after over 40k miles. As soon as I have worked out how to put some images on here I shall show just how serious a failure this is. Danny. Click the icon of a framed pic of a tree, third from the right. You will probably have to resize the pic, which is easy to do if you took the pic on your phone by using an app. When you add the pic it only shows as text, but you can view it when it is live on the forum, and you can then edit or delete if you are not happy with it. To add pix to a typed reply, when you’ve finished the typing, hit the "Go Advanced" button, and then the lower down "Manage Attachments" button. Last edited by dcunn; 15-04-2019 at 02:30 PM. Here are Danny's pics - I'll leave him to type up and add anything about them that he wants to ! I wonder if the failure is due in part to the welding together of significantly different thicknesses of metals, it would be interesting to get the view of a professional welder boiler maker or such, sadly not in my sphere of expertise. I would be interested in seeing pictures of the repairs that have been done and the approach people have taken. I spoke to Marlin a week or so ago about the fix they were looking at, they confirmed the "fix" would be to weld and plate the chassis and mounting rather than re-engineering/re-designing a solution to the split arb they originally went with on the M20 cars. Not pretty! Enough of a reason NOT to go down the route of compression struts. 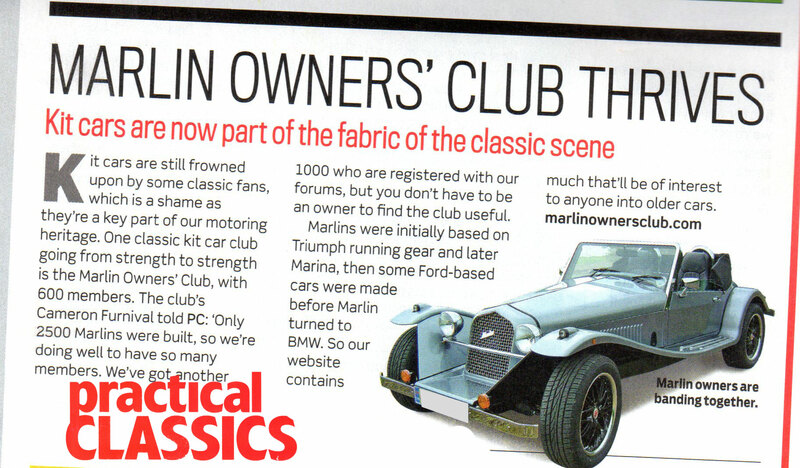 Its a pity that Marlin didn't adopt the sportster front suspension for the Cabrio then this situation could possibly have been prevented, particularly on the BMW engined version where they chopped the centre out of the ARB . Others should have just left the original ARB in place. Hindsights a wonderful thing. Hindsight is a wonderful thing but it should also be remembered that the main reason for fitting the struts to Millie was because I had a bent estate car anti roll bar. I had no idea the ARB came in different sizes. I agree that the sportster suspension is an improvement on the Cabrio (although that too has had problems). Given the correct ARB the Cabrio suspension is perfectly serviceable. « Do you drive the Ford i4 8 valve DOHC engine?